When signing up for Ubivox it is always free. 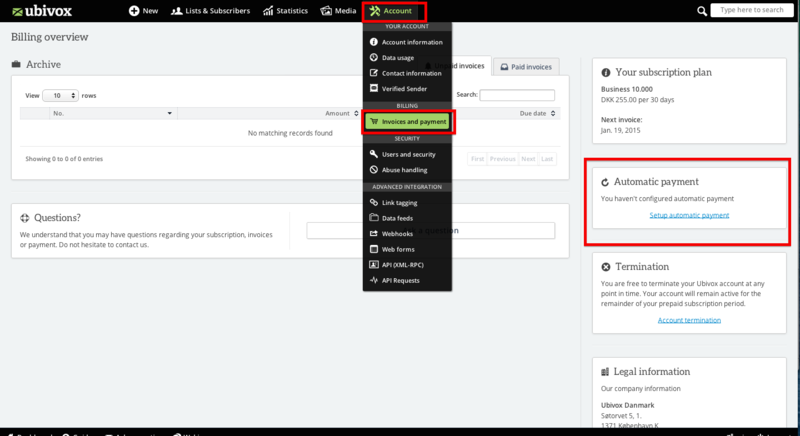 You can extend the trial period, for as long as you like, although in the trial period, you can only send to a maximum of 50 subscribers at the same time. To activate the account, which can be done at any time during the trial period, you have to enter your creditcard details. The price depends on which account type you have chosen, and the prices can always be found on www.ubivox.com. A subscription period lasts for 30 days. After activation of the credit card, you pay the subscription fee at day 1, and at the end of the period, any overflow usage on the account is paid, combined with the subscription fee for the next period. 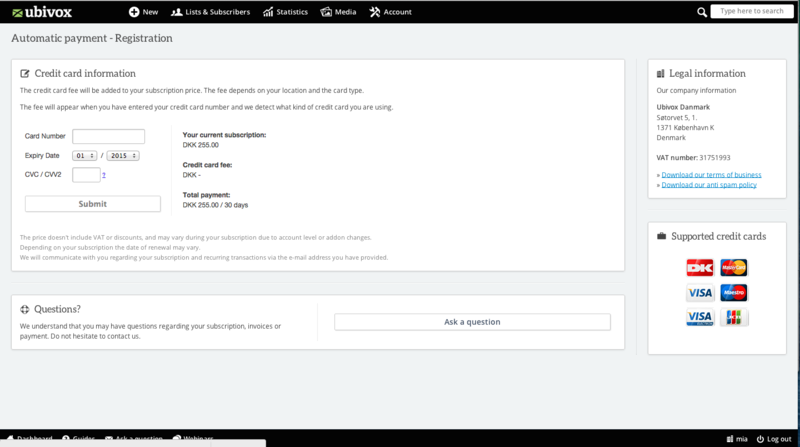 You can always cancel your subscription at Ubivox, just send an email to support@ubivox.com, 7 days before a new period starts. In the trial period, you can always see how many days you have left of the trail period in the bottom of the system. Click this, to activate the account. Then Add a credit card. And enter your credit card data. Choose account type, and click Continue activation. 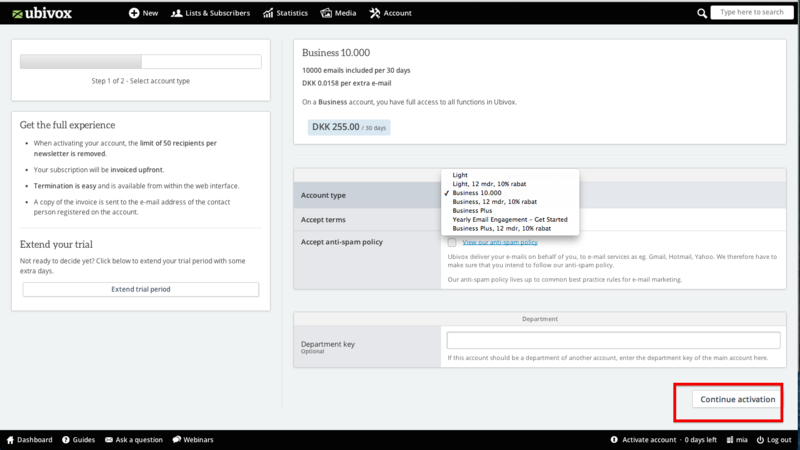 If you later on wish to change your creditcard details, you can click on Account -> Invoices and payment. When registering your card details, they are sent directly to our payment provider, Pensio, that are responsible for all our payments. Your data will not be stored at Ubivox, and our employees do therefore not have access to the information. Pensio is a PCI-certified payment provider, and are living up to all requirements regarding this matter, especially the strict rules from VISA and MasterCard. In other words, your data are in safe hands. Each morning (7 am danish time), the system will automatically draw money from those accounts, that starts a new payment period, which means that an account will pay every 30 days, if other products or services are not bought during the periode (i.e. a template, education, etc.). At each withdrawal, there will be sent a notification to the administrator e-mail connected to the account in Ubivox, containing the invoice etc. 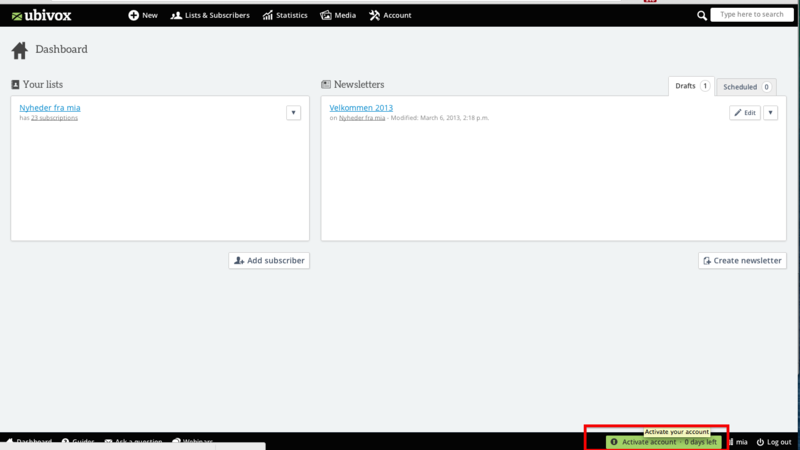 If a payment doesn't come through, the a notification is sent to the administrator e-mail added to Ubivox account. The most typical problem is that the card has been cancelled by the bank, either because it has been replaced by a new one or because it has been reported stolen or lost. Just update the information with the new credit card details. On rare occasions, the transaction can be caused by a mistake at PBS, our payment provider Pensio or our bank, B+S. In these cases the payment will often succeed the day after. If you have questions regarding a failed payment, don't hesitate to contact us on accounting@ubivox.com. The preferred payment method is with credit card, to keep costs down, thereby offering a cheaper product for our customers. If you wish to pay using a bank transfer, it has to be a yearly payment, and their will be an extra handling fee charged, amounting to DKK 350,- excl. vat. Write to sales@ubivox.com, if you wish to pay with a bank transfer or FI-card. This guide elaborates how you can organize subscribers and the information you have about them in Excel before you import to Ubivox.